Cooking the tomato sauce in a skillet and then cooking the pasta directly in the sauce made things even speedier. For a lightly thickened sauce, we used whole peeled tomatoes, pulsed in the food processor, which gave us more consistent results than canned crushed tomatoes. Sauteing the anchovies, garlic, and red pepper flakes at the outset provided a rich, savory foundation of flavor; finishing the dish with chopped kalamatas and capers preserved their briny notes and provided the big flavor we were after. A sprinkle of nutty Parmesan and drizzle of fruity olive oil pulled everything together before serving. Be sure to simmer the tomatoes gently or the sauce will become too thick. Pulse tomatoes in food processor until coarsely ground and no large pieces remain, about 12 pulses. 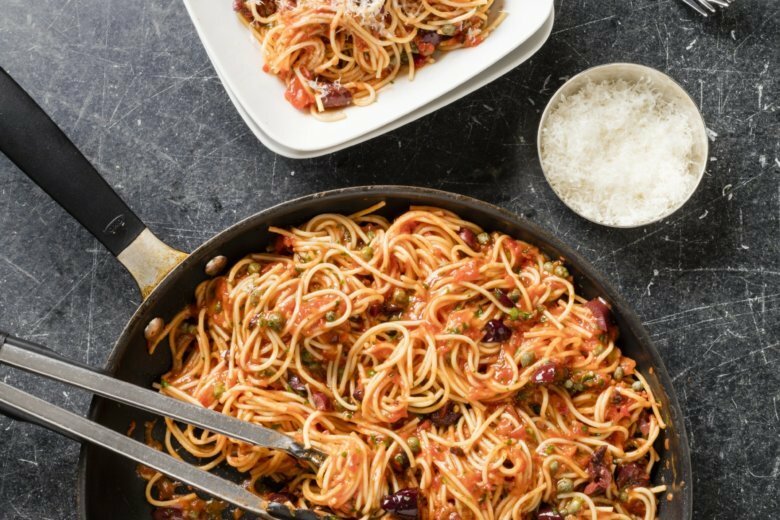 Cook 2 tablespoons oil, anchovies, garlic, and pepper flakes together in 12-inch nonstick skillet over medium-low heat, stirring constantly, until garlic is fragrant, 1 to 2 minutes. Stir in processed tomatoes and 1/2 teaspoon salt. Simmer gently until tomatoes no longer taste raw, about 10 minutes. Stir in water and pasta. Cover, increase heat to medium-high, and cook at vigorous simmer, stirring often, until pasta is tender, 12 to 15 minutes. Stir in olives, parsley, capers, and remaining 1 tablespoon oil. Season with salt and pepper to taste. Serve with Parmesan and extra olive oil. Nutrition information per serving: 544 calories; 151 calories from fat; 17 g fat ( 2 g saturated; 0 g trans fats); 6 mg cholesterol; 670 mg sodium; 79 g carbohydrate; 8 g fiber; 9 g sugar; 16 g protein.